It’s no secret that men can be difficult to shop for – making it personal can be even harder! So keeping in mind his personality when customising a ring for him is important. Is he a classic man? A modern day, style-conscious gent? Is he sentimental? Capture his spirit in a ring that says everything about him. Perfect for graduation gifts, symbols of commitment, birthdays and father’s day – the options are endless! 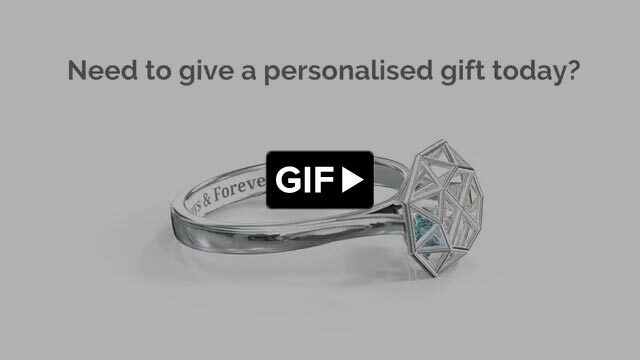 Personalise one of our high quality men's rings with a birthstone – for his partner or his children or get a stylish Tungsten ring engraved with a special message. Whether he prefers the simplicity of silver or the luxury of gold or Tungsten – we’ve created several options that you can play with to make sure he gets just the right gift. This men's ring features three classic fishes in a row, separated by two 2.5 mm gems that you can personalise with birthstones or Swarovski Zirconia colours. It represents things we can't necessarily see, but that we feel deep in our hearts. Have it custom made in your choice of sterling silver or gold and add a base engraving for a personal message.